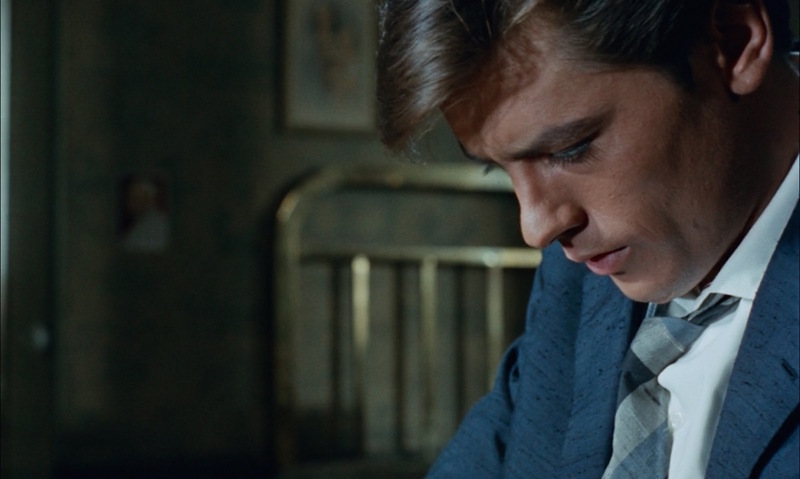 After a few leading roles in France, it was Plein soleil in 1960 that boosted Delon to international stardom. 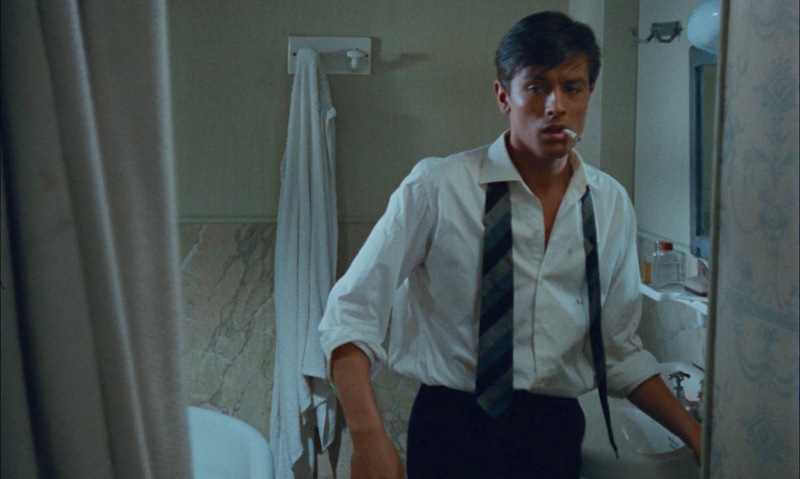 Released as Purple Noon in the English-speaking world, this adaptation of Patricia Highsmith’s 1955 thriller novel The Talented Mr. Ripley starred Delon as the cunning sociopath Tom Ripley, a portrayal that Highsmith herself highly approved of. 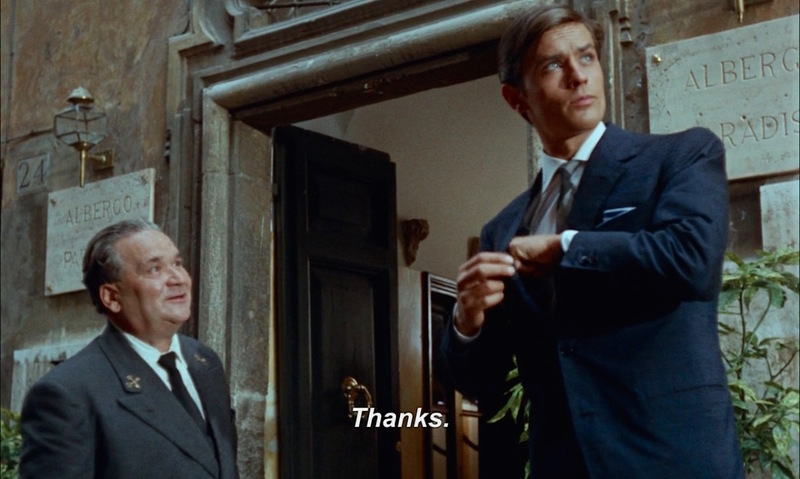 Following the murder of his friend Philippe Greenleaf (Maurice Ronet), Ripley begins taking steps to assume the deceased man’s identity, beginning with a trip to Rome in one the dead man’s bespoke suits and monogrammed shirts. 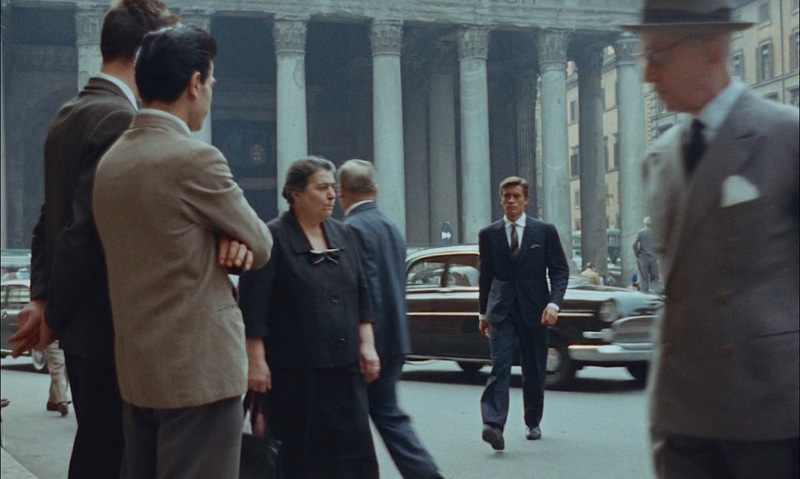 …or conducting business in Rome, in the case of Alain Delon’s Tom Ripley. Ripley prepares for a full day as Philippe Greenleaf. 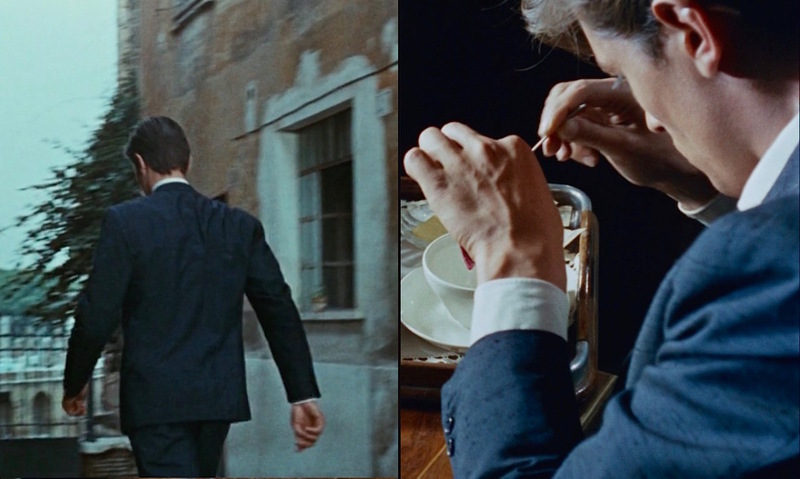 Having recently “inherited” the expansive wardrobe of the late bon vivant Philippe Greenleaf, Ripley dons a rich dark blue dupioni silk suit and sets out for a day of transactions ranging from brokering the sale of Greenleaf’s boat to forging his passport. In Dressing the Man, Flusser describes dupioni as “a luxurious shantung-style silk fabric made from a double silk fiber from two cocoons nested together… combining the best of natural fiber worlds.” He further offers that “the classic shades are cream, brown, blue, and elephant gray.” In dark, somber colors like charcoal gray, dupioni silk could make an argument for office wear, though Ripley’s bold blue suit plays to the elegant suiting’s potential for opulence. 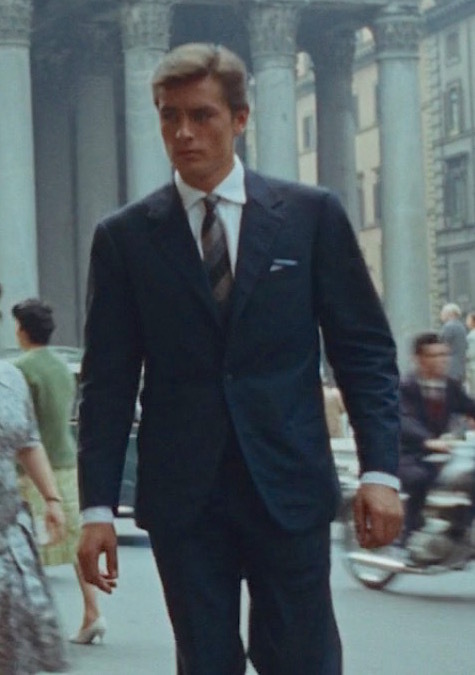 Despite the lavish qualities of the suiting, the fit and details of Ripley’s purloined blue suit are all business. The single-breasted jacket has notch lapels, a 3/2 button roll, a ventless back, and jetted hip pockets. Ripley adds a touch of color with a sky blue satin silk pocket square folded in his welted breast pocket, picking up the lighter blue of one of his tie stripes without being an exact match. Ripley’s suit jacket also has functioning three-button “surgeon’s cuffs”, hardly a rakish detail in itself unless worn as Ripley does with one of the buttons undone. Despite the likely apocryphal story that surgeon’s cuffs got their name from battlefield doctors unbuttoning their cuffs to roll up their sleeves before performing surgery rather than taking the time to remove their jackets, the more contemporary practice of a fellow leaving one or more of his sleeve buttons undone is more or less out of a desire to show off that the cuffs are not the ornamental variety typically found on off-the-rack jackets. Note the undone last button on Ripley’s cuff. The suit’s beltless trousers have a full, flattering fit with double reverse pleats and turn-ups (cuffs) on the bottoms. Ripley wears derby shoes made from black calf leather. Ripley makes an impression as he strides through Rome traffic. Ripley balances the less businesslike elements of the suit by wearing it with a classic white shirt and striped tie. The white cotton shirt has a wide spread collar, plain front, and button cuffs. The identity of the shirt’s true owner is made clear with the red-embroidered “Ph.G.” monogram on the left breast, signifying that Ripley’s transformation into Greenleaf is underway. “Discretion of paramount to good taste, and large or conspicuously placed initials are indiscreet,” writes Flusser of monogrammed shirts in Dressing the Man. He would likely approve of the understated monogram Greenleaf chose for his shirt… if not the disheveled way in which Ripley wears it. In a fine example of textural coordination, Ripley wears a slubby shantung silk tie that echoes his dupioni silk suiting. The tie is patterned in wide “uphill” stripes in navy, light gray, and light blue. Like knit ties and tweed, the slubby textures of the shantung silk tie and dupioni silk suit work together nicely to unify Ripley’s ensemble. With their complementary cool tones, this blue and gray striping is a common combination in men’s neckwear. Drake’s currently offers a half-shantung silk, half-cotton tie in a similar tri-color stripe. 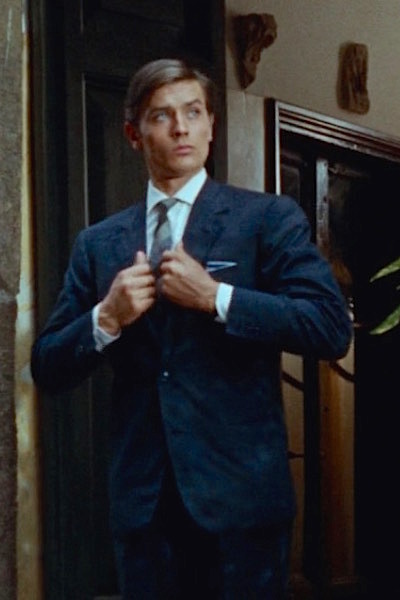 Dupioni silk’s long association with luxurious Mediterranean leisure makes it an ideal choice for the late bon vivant Philippe Greenleaf and the successor to his identity, Tom Ripley, who wears the suit in a business context with complementary cool colors that communicate his passionless professionalism.